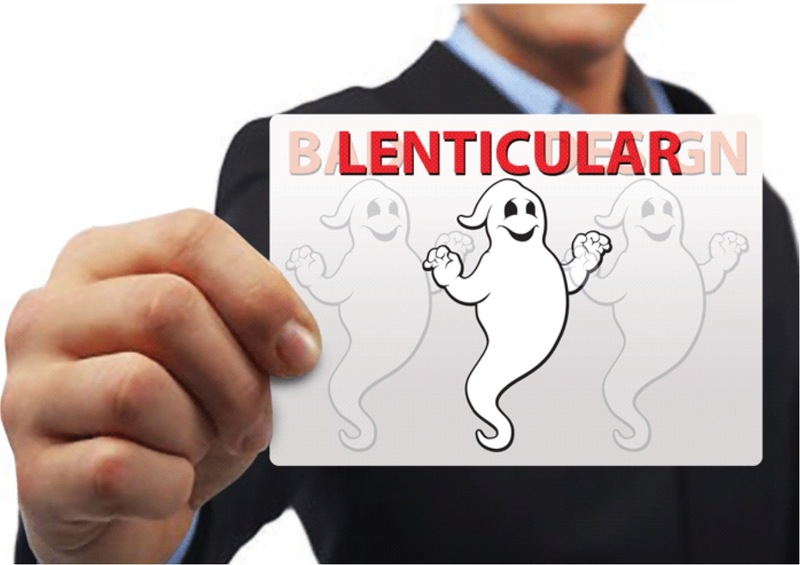 While Urban Dictionary might define ghosting as the act of ceasing all communication with someone you’ve been dating, in the context of lenticular design it has a very different meaning! Lenticular ghosting refers to the burn-in that shows from one frame to the next as your angle of view changes. So instead of seeing one image distinctly, you see an additional image (or multiple images) burned in along with the image you should be seeing. Where does lenticular ghosting come from? Left/Right vs Up/Down. Left/right animations ghost more than up/down animations. Number of frames. The more frames you use, the more ghosting you will see. Put another way, the fewer frames you use, the more distinctly you will see each frame (see “How many frames can we use?”). Contrast. When there is high contrast between what appears in any one image and what appears in the prior or following image, there will be more ghosting. If you have a heavy black element in frame 1 that changes to a solid white background in frame 2, that black element will “ghost” into that second frame. Minimizing contrast from one frame to the next will minimize the burn-in. Any one of the above may work just fine. Two of them is trouble. Three of them will lead to very frightening results. Should I Be Afraid of Lenticular Ghosting? Not necessarily! Sometimes ghosting isn’t a scary problem. If you have an animation that shows small progressive changes, like a curtain opening, and you see a little bit of frame 2 at the same time as frame 3, that just simulates motion blur and can look okay or even help the effect. Look at the “Dancing Girl” image on our homepage. This piece has plenty of ghosting but that just makes our dancer’s movement appear more fluid. But now imagine you have a lenticular postcard with a solid white background and each frame of the animation contains a different line of black text. In this case, any ghosting would be noticeable and objectionable. Text on top of text is not pretty and in this case, it would really muddy the message. The fact is that almost every animated lenticular image has some ghosting in it. It’s part of the charm and part of what makes them fun to play with. So when designing your image, don’t be too afraid of ghosts. You can’t design them away and there’s no need to try. What you can do is design your image so the ghosting is friendly to your design and not its downfall. If you would like to discuss your image and your goals, reach out to us and let’s talk!